Taking a little break from blogging about special ed issues to write about something that is actually going right in my life. The prologue to this is that we still don’t know where we’ll be in July. And won’t know for at least a few more days. But, I have a project! That little ugly duckling house we got a contract on a couple of weeks ago and are closing on in about ten days. It needs work: siding, gutters, painting inside and out, tree work, a bit of landscaping. Of course, we must address this issue of the rooms with no light fixtures–what is up with that, anyway? And it all needs to be done before the end of June, because we are either renting it out, or living in it. No pressure! Some people–OK, most people–would think it is insane to take on renovating a house when about to move overseas. But for me, the timing is absolutely perfect. I already sold the house I’m in, which of course involved getting everything sorted out and fixed up, which means I’m pretty much good to go on packout. Just need to stick post-it notes on everything and pack my suitcase. So, basically, I’d just be sitting here twiddling my thumbs if I didn’t have a house to fix up. But now, not only can I at least be sure we’ve got somewhere to live if Vienna falls though, but I’m getting estimates, picking up paint samples, shopping online for lights and fixtures, and generally staying busy. I’m good at this. I ought to be, after fixing up this house! I know what needs doing, who to call, what supplies to buy, about how much it will cost, and how long it will take to prime and paint over many square feet of blood-red, gunmetal gray, and avocado green walls. I have a lot of practice in making these decisions, and I know a good deal when I see it. And, I know where to look. Today, I found a perfectly respectable oval framed bathroom mirror for $25 at Goodwill to replace the builder-grade plain glass mirror in the guest bathroom. 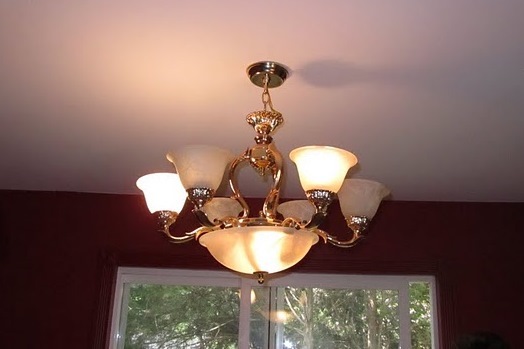 And I am picking up a $25 modern-looking nickel chandelier tonight from a Craig’s List seller to replace this gilt-ridden beast. I am sure in bordellos they have lights like this, and paint all the room trim red, too. The master bedroom has got to be painted over right away. I’m afraid I might wake up and momentarily think I have been eaten by an avocado. Shiny brown bathroom of doom. When we first saw the house the look was further enhanced by an animal-print shower curtain and bathmat. There is a creative element to all this renovating that I love. But for me, right now, the most important thing is that this is one aspect of my life over which I have control. No waiting around on anyone else to make up their minds. The next three years of my life may be uncertain and out of my control, but by God, if I want to paint over a red room or change out a light fixture, I can do it just the way I like. And that is something that you really learn to appreciate in the Foreign Service! Next ADHD and the Foreign Service Part Three: Between the Needs of the Service and the Needs of Our Kid, Guess Who Wins? 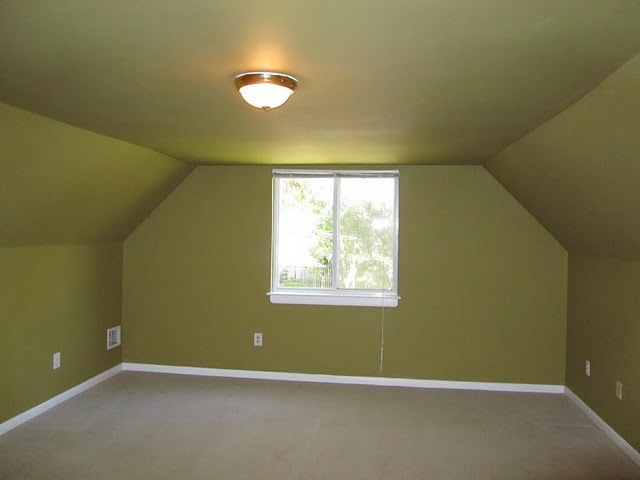 I’m always amazed that people love to paint rooms with deep colors of satin paint. As if the 360 degree color intensity wasn’t enough, let’s make it shiny as well… But what is it with this house…they painted all the ceilings too. Isn’t that a housing standard…ceiling paint actually comes in a pre-mixed color…ultra bright white. I think you need to add the painted ceilings to the list of crazy decorating, with the all-animal-print-all-the-time thing. The house is kind of dark, too, like most of the houses in Reston, because there are so many trees. Especially the attic bathroom! I can’t imagine what they were thinking. They even painted over the heat vents, outlets, and light switches with this weird glittery brown paint. But, it’s just paint and easy to fix. 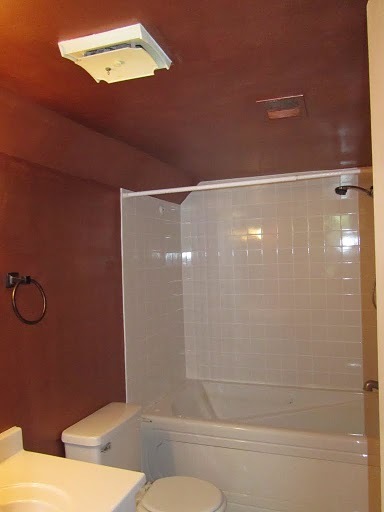 When we move in (presumably in three years) a skylight or Solatube for this bathroom is definitely on the list, along with removal of the tacky Jacuzzi and installation of a big shower with recycled glass tile walls. Maybe I had better get a job at post…. Great perspective on it all! Will keep fingers crossed that all goes well with a departure date. When you do get to post, consider finding something in Facilities. We definitely need as many competent people there as possible since it makes the assigned housing work well and look great!